No matter how many times we reincarnate... it's set in stone... who we live for. Protected by Saturn, planet of silence. I am the soldier of destruction and rebirth. 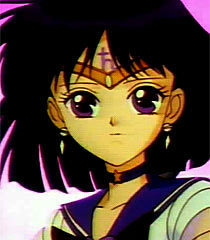 I am Sailor Saturn! Saturn Planet Power, Make Up! The princess is in serious danger. We must save her. Is that really you, Sailor Pluto? I think purple's a nice touch.